Counseling professors Musangali and Stehn will lead a discussion also available online. 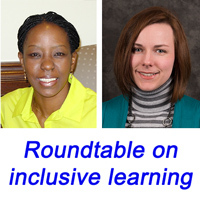 The annual Webster University Teaching Festival continues Tuesday with a roundtable discussion on ensuring student competency while supporting student success, a panel presentation with Webster students on integrative learning, and a workshop focused on Office 365. Faculty, staff, and students are invited to participate in the week's events. Tuesday's roundtable will also be available globally via Webex online stream. Participants are encouraged to RSVP by clicking here. A complete program of activities can be found on the 2018 Teaching Festival website.